Yes, walk-up registrations are available starting at 8am. You can also register at Early Packet Pick-up on Friday, April 27th, from 12pm to 7:00pm at ASK’s office located at 5211 West Broad Street, Suite 102, Richmond, VA. 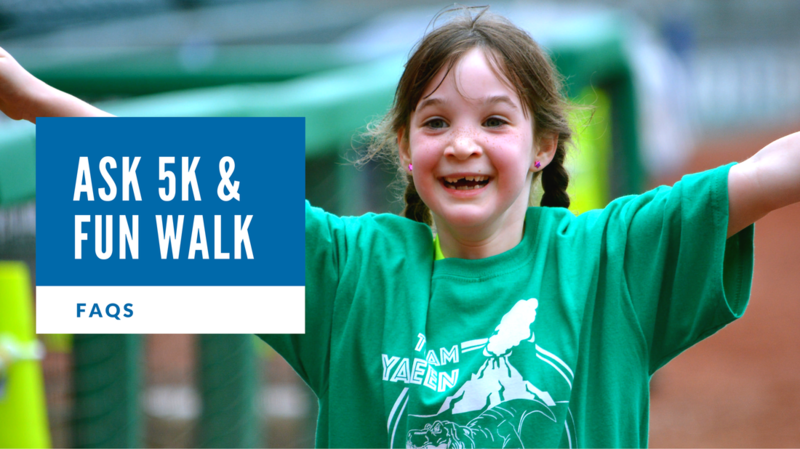 Your walk/run registration includes a t-shirt, finisher medal, and ticket to the Flying Squirrels game on Saturday, May 19th, for ASK Day at The Diamond. Because you receive these awesome goodies in return, your registration is not tax deductible but donations are! All kids aged 6 or older must register to take part in the 5K. They will receive a bib number and t-shirt. Younger kids (age 5 or below) are welcome to take part for free; however, if your youngster would like a bib number and t-shirt, they must be registered. Registered runners will have timing chips. Results will be posted on this site as soon as possible after the event. A timing clock will also be in view at the start and finish lines. We are sorry but we do not offer refunds. If you are unable to participate, you are entitled to pick up your t-shirt and goody bag at early packet pick-up. We’re also happy to convert your registration to a donation. Just give us a shout at racedirector@askccf.org or 804-658-5910. Parking is available at The Diamond via the entrance off Robin Hood Road, behind the Arthur Ashe Athletic Center. Registration and packet pickup is at the Party Pavilion located outside right field of the ballpark. The starting line is directly in front of the Party Pavilion along the 1st base line of the stadium. Yes, Early Packet Pickup will be on Friday, April 27th, from 12pm to 7:00pm at ASK’s office located at 5211 W. Broad Street, Suite 102, Richmond, VA. Yes, packet pickup is available starting at 8am at the Party Pavilion located outside right field of the ballpark. Be sure to give yourself time to park, pickup and get to the starting line by 10am. Finish line food includes granola bars and bananas. Plus we'll have free treats at our post-race festival. All types are welcome at our event. If you're participating in the race, please line up behind the runners at the start line. If you're a spectator or heading to the concourse for the post-race festival, there is an elevator located inside the stadium which can be accessed through the tunnel. Handicap seating can be found behind home base and behind third base on the Main Concourse. Probably best to leave Fido at home as there will be a lot of people , kids, and even clowns at the event. He'll be there, of course! Check out the family festival in the concourse or take a seat in the stands near home plate to cheer on the runners and walkers crossing the finish line. Then, at 11:30, get ready for the awards ceremony recognizing top finishers, top fundraising teams and largest team – plus, the Kourageous Kids Victory Lap where we need everyone to cheer on our brave children. WHAT'S ASK DAY AT THE DIAMOND? As special honorees of the Flying Squirrels, our ASK kids will be recognized on the field during Saturday's game with fireworks on May 19th. ASK kids will take part in singing the national anthem, throwing the first pitch, and competing in sideline games. All ASK kids are invited to participate in the Kourageous Kids Victory Lap during the 7th inning stretch. Your Flying Squirrels game ticket is included with your registration and will be in your race packet. This is a special event you don’t want to miss! Wear your ASK Walk t-shirt to the game! Bring your friends! Take lots of pictures! Make some noise! See you there!